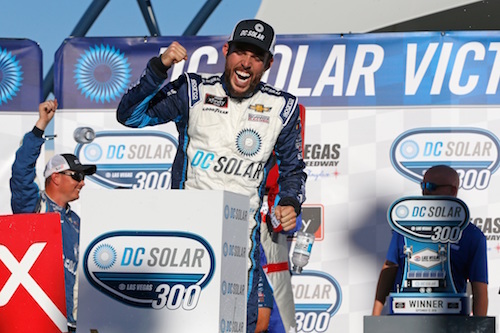 NASCAR Xfinity Series driver Ross Chastain is proof positive that race results aren’s exactly indicative of a driver’s talents, especially when said driver is with a small, underfunded team. This is no knock, whatsoever of JD Motorsports, but Chastain wasn’t getting much attention, as he wasn’t exactly setting the world on fire, in the No. 4 JD Motorsports seat. He did capture the attention of team owner Chip Ganassi, though, and Ganassi definitely hepled get Chastain the attention he, apparently, deservies. In the 24 races this season with JD Motorsports, Chastain finished in the top-five once. In the other three races with Chip Ganassi Racing, he finished in the top-five twice. Not to mention, he dominated the other race before getting involved in an on-track incident with Kevin Harvick. Specifically, in three races behind the wheel of the No. 42 CGR entry, Chastain has finishes of first, second and 25th. Also worth noting, Chastain claimed four of six possible stage wins and led the most laps in two of those races. He finished in the top-10 in the two stages he didn’t win. Put bluntly, Chastain deserves better than JD Motorsports. Again, that’s not intended as an insult to JD Motorsports. After all, I’m sure owner Johnny Davis is doing the best he can with the resources he has. I’m just suggesting that Chastain deserves to be with a team that has the means to put him in a more competitive car week in and week out. In the short term, Chastain deserves a better shot at the 2018 Xfinity Series championship. He’s in the playoffs, but he’s slated to be in the No. 4 for the remaining six races of the seven-race playoffs. I feel good about his advancement to round two in a couple more races, as he heads into the second race of the three-race round fourth in the standings. In the second round, he has the benefit of 10 playoff points, courtesy of his race win and stage win. Maybe that’ll be enough for him to overcome his car handicap to get to the finale at Homestead-Miami. Even so, he’ll definitely be heading upstream in a rowboat at Homestead. Now, to the future. Surely, Chastain will get a serious look if there’s a top-level Xfinity team looking for a talented driver for next year. The available seat at JR Motorsports has been filled by Noah Gragson. I’m guessing Joe Gibbs Racing won’t have a seat available, because if there was an opening there, wouldn’t Gragson have filled it? Those are the two top teams in the series, but surely, there has to be a better seat for Chastain, somewhere. Here’s an idea; what about Ganassi putting him in the No. 42 full-time next year?